True on-line, double conversion, three-phase UPS system is the right solution to support a maximum efficiency data is just one of the many varieties to choose from. The Avocent PM1000 Power Distribution units (PDUs) support strip level metering to provide datacenter professionals the tools they need to monitor, reduce, and manage their growing power consumption costs of IT equipment. Thresholds can be created to allow datacenter teams to know before problems occur and minimize downtime caused by overloaded circuits. The ability to integrate with the DSView3 management software enables IT managers to have a consolidated interface to access and manage their IT equipment and also the supporting power infrastructure. 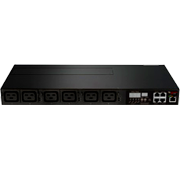 The optional DSView Power Manager further enhances this by allowing historical reporting to track power consumption, capacity and cost across individual PDUs, racks, rows of racks, or entire data centers. Advanced power measurement, control and management for your remote IT equipment — The PM 2000/3000 PDUs include single-phase and three-phase models that support strip-level metering, outlet-level metering (PM2000) or outlet-level metering and switching (PM3000). Outlet-Level, Phase-Level and Strip-Level Current/Voltage/Power Metering with Threshold/Alert Capabilities – Provides preemptive notification of any impending overload issues before they occur and simplifies the task of installing new equipment (Note- measurement resolution +/- 5%). Capability to Remotely Switch Outlets Through On-Board Web Interface, Avocent DSView management software – Allows power to hung up IT equipment to be recycled, turned on or turned off remotely for faster resolution time (PM 2000 PDUs). On-Board Web Interface – Can be installed for direct access right out of the box or it can be configured as part of a larger integrated solution using the Avocent DSView management software. IP and Serial Interface Options – Options to install by connecting directly to the network or save IP connections by using the serial interface to connect directly to Avocent appliances already connected to the network. Daisy Chaining – Saves the number of IP addresses or console/KVM ports that are required to manage all power distribution needs. Integration with Avocent DSView management software – Single interface for management of IT equipment and PDUs simplifies mapping of outlets to servers and other equipment in order to reduce and minimize power cycling the wrong equipment. Integration with Avocent DSView Software Power Manager Plug-In – Track historical trends to measure and monitor IT power consumption, capacity and cost in order to understand what issues exist and to make more informed decisions in the future. Electronic Overcurrent Protection – An added layer of protection that is activated in the event of minor overloads; during such events, outlets are turned off first instead of the primary overcurrent protection (OCP) tripping. Sequential Startup – Protects integrity of all upstream electrical infrastructure by staggering the inrush current draw of all plugged-in devices. Internal Temperature Sensor and Two Optional External Sensors – These sensors can measure environmental factors at several different points within the rack. Measure and monitor power consumption at the strip level. Create thresholds to generate alerts/notifications. Flexible installation- IP and Serial interface options. Can be managed directly or integrated with other Avocent solutions using the DSView 3 software. Optional DSView 3 Power Manager for historical reporting. Strip level and circuit level metering with threshold and alert capabilities – Provides preemptive notification of any impending overload issues before they occur, and simplifies the task of installing new equipment. On board web interface – Can be installed for direct access right out of the box or it can be configured as part of a larger integrated solution using the DSView 3 software. Daisy chaining – Saves the number of IP addresses or console / KVM ports that are required to manage all power distribution needs. 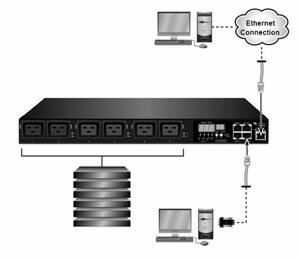 Integration with DSView 3 – Single interface for management of IT equipment and PDU’s simplifies mapping of outlets to servers and other equipment to reduce and minimizes power cycling the wrong equipment. Integration with DSView 3 Power Manager – Track historical trends to measure and monitor IT power consumption, capacity, and cost to understand what issues exist and to make more informed decisions in the future. Electronic Overcurrent Protection – Electronic Overcurrent protection is an added layer of protection that gets activated in the event of minor overloads. During such events, outlets get turned off first instead of the primary overcurrent protection (OCP) getting tripped. Supports external sensors for environmental monitoring capability – Provides preemptive notification of any impending environmental issues. 5kW – 22kW power capacity with a mixture of C13 and C19 outlets – Simplifies the deployment of high-density racks that include a wide range of equipment types and power requirements.